Provide comfort for the family of Roger Wilcox with a meaningful gesture of sympathy. 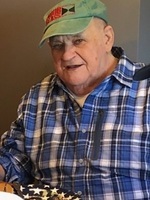 Roger Leon Wilcox, 83, of Reservoir Rd., Morrisville, NY, passed away Tuesday, January 22, 2019 at Faxton-St. Luke’s Healthcare in New Hartford. He was born June 8, 1935 in Utica, a son of Clifford and Clarabel Louise Short Wilcox. He was a graduate of Morrisville-Eaton High School in 1953. Following graduation, Roger enlisted in the U.S. Marine Corps in 1953, serving during the Korean Conflict and was honorably discharged in 1956. He continued his education at Morrisville Ag & Tech College majoring in the food tech program, graduating in 1958. After college, he worked at Nower’s Market in Hamilton from 1959-61, and then for ten years in the meat department at the Grand Union store in Cazenovia. In 1971, Roger opened his own business, Roger’s Market on Lebanon Street in Hamilton which he operated for 27 years. Following the sale of his business, he joined Price Chopper in Oneida from 1998 until his retirement in 2010. Roger married the former Bonnie J. Pierson, daughter of Kermit and Olive Stone Pierson, in 1958, a union of over 60 years. He was a member of the Eaton Community Bible Church; the Marine Corps League; and the American Legion Post #375 of Hamilton. He was also a member of the Morrisville Lions Club where he served as “King Lion” for 3 years and received the prestigious Melvin Jones Award. He was instrumental in projects such as “adopt a highway clean-up”, increasing membership and many fundraising functions such as the sports field at Morrisville High School, chicken Bar-B-Q’s, chicken-n-biscuit election day dinners and scholarship funds. Roger was a big sports enthusiast. He was a fan of the Miami Dolphins and the Cincinnati Reds, as well as Jack Bruen’s Colgate basketball team. Roger was also an avid card player, and if there was a game going, he was usually there. Surviving are his wife, Bonnie; his children, Sherry (Robert) Straczuk of Munnsville; and Gregory Wilcox of Hamilton; sisters, Frances Streeter of Oneida; Kimberly (William) Jackson of Highland Ranch, CO; Roxanne Wilcox of Vero Beach, FL; brother, Terrance (Lois) Wilcox of Hamilton; three grandchildren, Patrick (Cathy) McDonald of Charleston, SC;, Cory McDonald of Norwalk, CT; and Benjamin Wilcox of Hamilton; a great-grandson, Leo McDonald of Charleston, SC; sister-in-law, Joyce (Ken) Anderson of American Fork, UT; brother-in-law, Norman Pierson of Oneida; and many nieces and nephews. He was predeceased by his father, Clifford in 1994, his mother, C. Louise Taylor who died at the age of 101 in 2015; and a brother-in-law, Victor Streeter in 2012. In keeping with his wishes, there are no calling hours or funeral service. Private graveside services will be held in the spring in Graham Cemetery, Hubbardsville, NY. In lieu of flowers, contributions in his memory may be made to the Morrisville Lions Club, PO Box 445, Morrisville, NY 13408. Arrangements have been entrusted to Burgess & Tedesco Funeral Home, 31 Cedar St., Morrisville. To send flowers in memory of Roger L. Wilcox, please visit our Heartfelt Sympathies Store. My deepest sympathies, Michele sent flowers to the family of Roger L. Wilcox. So sorry to hear this sad news . My deepest sympathies to you and all the family. Please know you are in my thoughts and prayers. He was a wonderful person thougthful and caring and I have got great memories of him .❤️🙏. Laura. Uncle Roger brought so many gifts to our life. We will never forget him! My deepest sympathies, Michele purchased flowers for the family of Roger Wilcox.